What will you nickname your GEN 5 Pokemon? Here's a few of mine! I might trade in mijimaru in to black from white. Also, Should This go in Pokémon Black and White Section? Last edited by Fubab_107; August 19, 2010 at 05:26:05 PM. I'm naming Shimama, Horsey and Tsutaaja, Smug. Mirmjamu(If evos are water/fighting): Karateh!! Last edited by Leaftail; August 28, 2010 at 02:45:48 PM. I might not nickname any pokemon, but it depends if i feel like it plus i would'nt know what to name one. NON-NICKNAMERS SMELL OF CHEESE THAT WAS GONE MOULDY! Last edited by mew1539; September 15, 2010 at 09:30:13 AM. I shall call Churine = Coot! I don't nickname Pokemon... They name me! Tsutarja, which I will name Smugleaf, is the only pokemon I know I will attain throughout my journey. The rest shall be completely random, or the ones people hate the most due to poor design. I won't include Zekrom or the other legendary, should I attain one into my team. Why is it that so many nicknames that people use are just plain... Goofy? I prefer to take the badassery route with my nicknames. Location: School, football, doing HW, etc. You completely read my mind with the last one. I have my team now. My team and nicknames so far. My nicknames, along with my thought processes for anyone who cares. Last edited by Cyrus; March 10, 2011 at 04:08:14 PM. Serperior: Smugleaf. Snivy was dubbed this when it first came out, so I thought that it was only fitting! Gigalith: Acorrock. Roggenrola looked kind of like an acorn, so I mixed acorn and rock. Too bad it evolved, thus rendering the name a little useless. Jellicent: Jellybob. Favorite character in Dr. Mario 64. It only seems right to pay homage to that wonderful character and game. Conkeldurr: Carushnurr. He certainly crushes things. And the nurr part kind of goes with the name endings that the rest of them have. Alakazam: Telekineso. I typically name all of my Alakazams this, so continuing the tradition seems only fair. - My grandma has a parrot who looks like him. He was my favorite, and now Aaken is my favorite. - His shape reminds me of the christmas lights, and he's part electric. So he's named LED. Last edited by Shiny; March 11, 2011 at 03:21:23 PM. To be updated as I catch stuff. Last edited by The_Stoole; December 2, 2011 at 05:14:12 PM. Best name I got was my second playthrough. My tsutaja was named h8rsgunah8. I nicknamed my Scoilpede Virulence, my Galvantula Killajoule [As opposed to Kilojoule], and my Krookodile Frightile. Other than those three and Ma'at, I save the other two slots for HM slaves and the occasional type-effective. For instance, my Golurk has been nicknamed Ghoulem. 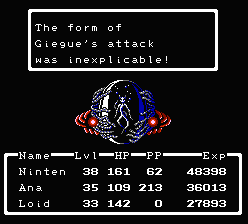 Giegue is the final boss from Mother/Earthbound Zero, a Japanese Nintendo RPG for the Famicom/NES. Flatland is a movie based off of a book which uses math to describe dimensions in space. One character is Spherius, a three dimensional being who helps the protagonist at one point. Hydreigon is a sphere for dragon's sakes. DJ PantsLizard K was a one time character in a parody web fancomic based on Black and White.